About 25 years ago, my co-author Ritsuko Nakata taught me how to make cubes out of milk cartons, and I’ve been using them in class ever since. 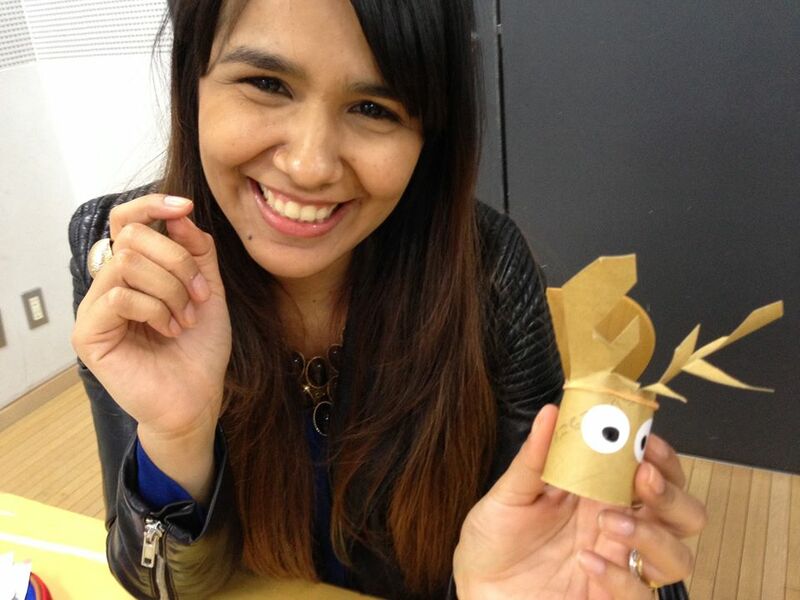 I love recycling things and coming up with new ways to use them in lessons. I know that a lot of you do, too, so I’m beginning a new category for Teaching Village so that you can share your own ideas for creating and using inexpensive or free teaching materials. Recycling always makes good sense for the environment, and in tough economic times it also makes sense for our classrooms. Write students names on the sides of a cube (or cubes if you have class larger than 6 students). Roll the cube and ahve students read the name to see whose turn it is. Draw punctuation symbols on the sides to cue which types of sentences or questions you want students to make. Write Yes or No on the sides to cue answers to questions. 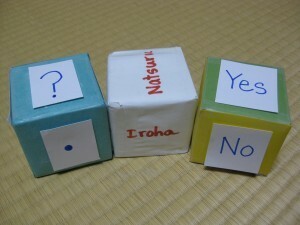 Rolling a cube can add a game-like feel to drills by introducing an element of chance. You can have students write numbers they need to practice on each side of a cube. 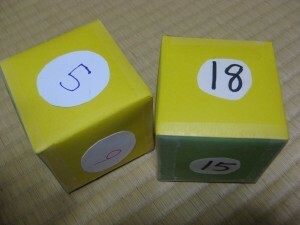 Younger students can roll one cube and say the number in English. 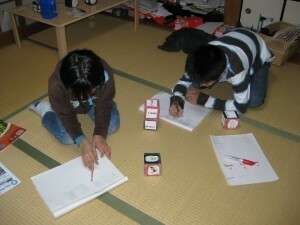 Older students roll multiple cubes, add the numbers together and say the sum in English. One cube is for vowels. Repeat ‘a’ twice or have one cube side be a ‘free choice’ vowel. I let students pick the 12 consonants for two additional cubes. They make better consonant choices if they have a chance to look at a word list of CVC words they’ve already learned (or can sound out). 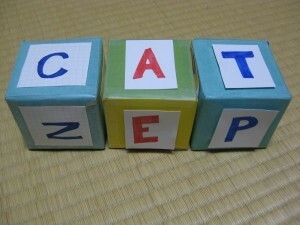 Students roll the cubes and see if they can put the three letters together to make a word. As a group, students decide if the word they’ve formed is a “real” word. If unsure, we pull out the dictionary and look it up. Remembering word order in English sentences is a constant challenge for my students, and cubes provide a fun way to practice. For my youngest students, it’s also a good way to reinforce which verbs go with which objects (I like cats vs. I have a cat). I make cubes using the sentence patterns they’ve been learning in class. 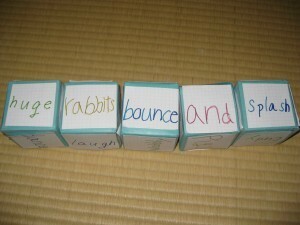 Students have fun taking turns rolling the three cubes and deciding if they can make a sentence with the words shown. Older students like putting together longer sentences and they enjoy creating their own cube games. 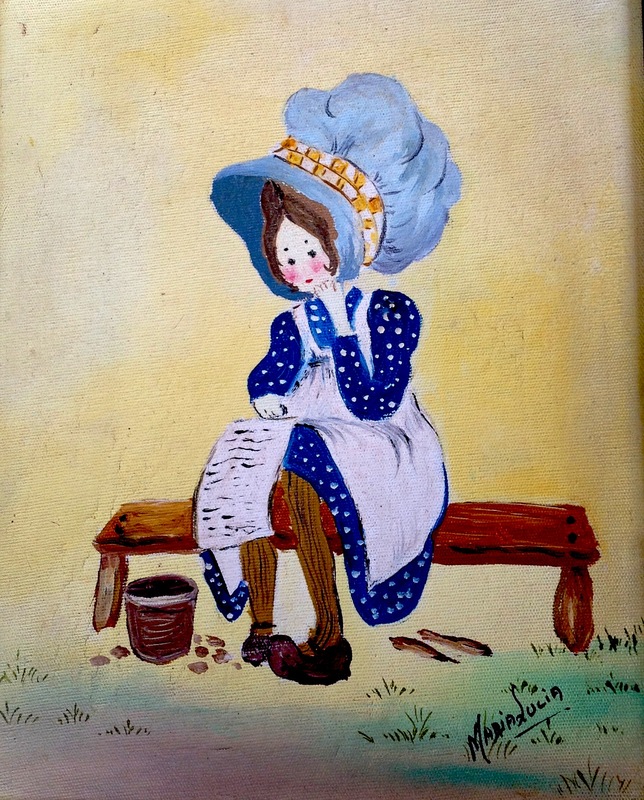 To start, I have them brainstorm and list plural nouns (for subjects), verbs, and adjectives. For 5 cubes, they choose 9 nouns, 7 adjectives, 9 verbs and write the words on on cube sides, mixing so that each cube has at least one word from each category. Each cube should also have one side with and. My students decided to use different colors for each category of word. Students have fun making up different rules for games, but here are two versions that have worked particularly well. 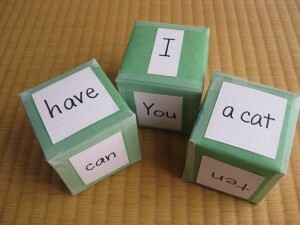 In the first game, students roll four cubes and collect words to use in a sentence. They label columns noun, verb, adjective, conjunction and write words from each roll in the appropriate column. When they have enough words to make a sentence they cross those words off their lists (so words can only be used once). Students get 1 point for each word in their sentence, so longer sentences earn more points. Younger students might create shorter sentences, but they also tend to make more sentences, so older students don’t really have a point advantage in a mixed ability class. In the second game, students roll five cubes. They choose which words to keep and set those aside. Then, they roll the remaining cubes. Students have three rolls in which to form a sentence. 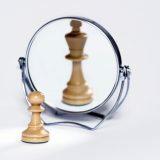 If they succeed, they earn a point. If they can’t make a sentence after three rolls, play passes to the next student. My students also use milk carton cubes to practice writing sentences and stories. First, students brainstormed characters, settings, and objects and then agreed on six of each (to create one cube for each category). To play students roll the cubes and write silly sentences based on the words showing (The princess played the piano on the soccer field). Once they become comfortable writing sentences, the roll of the cubes determines the first sentence in a collaborative story. Students take turns adding sentences to expand the story. The final student in the group is responsible for coming up with the ending (since the other point we’re beginning to work on is that stories have a beginning, middle, and end). This slide show shows the steps in more detail, along with examples of student writing. These are some of the ways I recycle milk cartons in my classroom. I love that I’m recycling something I would otherwise throw away and I don’t have to feel bad if students step on one and crush it. 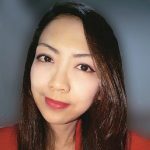 Do you have more ideas for using cubes in your lessons? 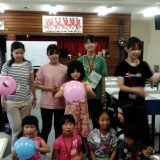 I hope you’ll share your ideas with us. 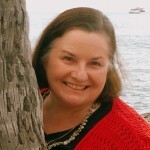 Note: This article by Barbara Hoskins Sakamoto originally appeared as a guest post on Teaching Village and is licensed under a Creative Commons, Attribution-Non Commercial, No Derivatives 3.0 License. If you wish to share it you must re-publish it “as is”, and retain any credits, acknowledgements, and hyperlinks within it.